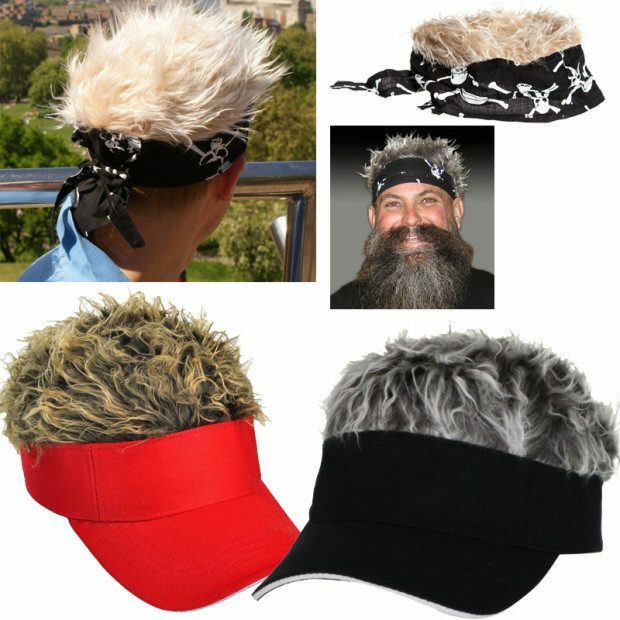 Flair Hair Bandana Or Visor Just $4.99 Ships FREE! You are here: Home / Great Deals / Flair Hair Bandana Or Visor Just $4.99 Ships FREE! Order the Flair Hair Bandana Or Visor for Just $4.99 Ships FREE! Need a spikey flair to your day? Flair Hair is the answer! You can wear Flair Hair Visors anywhere. The comfortable adjustable bandanas and visors with hair are great for golfing, fishing, riding your motorcycle, hiking in the mountains and anything else you can think of. No matter where you go, our hats with hair ensure you will be the life of the party. Whether you want to sport the blonde colored hair you grew up with, or throw in a change-up with brown, black, or gray; people will notice!